Coinciding with Warner's Tuesday bow of the web-enabled HD DVD version of 'Blood Diamond,' Toshiba of America is offering a new firmware upgrade for its second-generation players. Toshiba is making the update available for its second-gen player models HD-XA2, HD-A20, HD-A2W and HD-D2. Certain HD DVD discs may contain or have the capability of downloading studio-provided, Web-enabled network content. To minimize any potential capability and/or connectivity issues, before viewing such content, it is recommended that you perform the firmware update process. The firmware can be accessed for direct download via the player's Ethernet ports. The upgrade can also be obtained for download at the company website's customer support section, or users can request a copy of the firmware free on CD (sent via traditional mail). 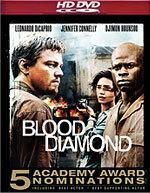 For more on 'Blood Diamond's pioneering web-enabled content, check out Peter Bracke's just-posted comprehensive review.